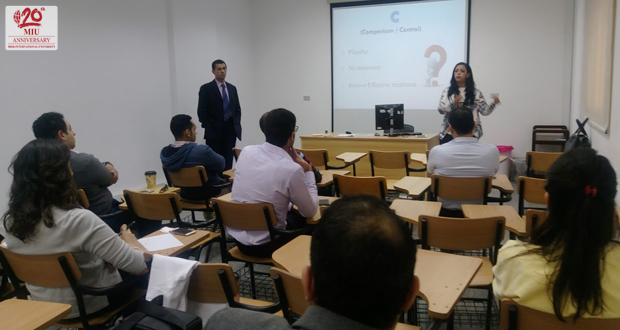 Aiming to increase awareness among the Teaching Assistants and to prepare them to conduct clinical trials using evidence based methods, a workshop entitled “Clinical Trials” was conducted on Wednesday 29th March 2017 by Dr. Khaled keraa and Dr. Maryam Samy and was organized by the Staff Development Committee of the Faculty of Oral and Dental Medicine. The topics included the concepts of randomization, blinding, sample selection and sample size calculation. Sixty percent of the attendees rated the course as “excellent” while 40% rated it “very good”. The recommendations were to conduct more detailed workshops with practical application.